Stock up now or pay more later. Between the arrival of Kaby Lake, Ryzen being right around the corner, and perhaps even Cannonlake launching at the end of 2017, there could a surge in new system builds and upgrades this year. For those of you who are waiting to see how things shake out before pulling the trigger on a pile of parts, you might want to consider buying RAM now rather than later. If you wait, prices could go up. 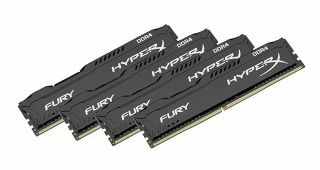 We can't definitively say they will, but there has already been a spike in RAM pricing, reasons for which we explained a few months ago (mainly it has to do with smartphone players gobbling up chips just as fast as memory chip makers can supply them). Looking ahead, Nanya Technology president Pei-Ing Lee told Digitimes that he expects price hikes to continue through the second quarter of 2017 before starting to stabilize in the third quarter. Lee expects the supply of DRAM chips to fall just short of demand this quarter and next, adding that the average selling price (ASP) will rise accordingly in both quarters. He did not say to what degree. Based on past price increases in DRAM we don't anticipate RAM kits skyrocketing, though it's difficult to tell. To put things in perspective, we noted in October that prices had jumped in recent weeks, going from a fairly steady $60-$70 for a 2x8GB kit to $75 or more. At the time, PC Part Picker's price history for a kit of G.Skill Ripjaws V Series 16GB (2x8GB) DDR4-2400 had gone from around $55 to about $90. Now three months later the same kit is trending close to $110. Thankfully that's not the case across the board, as there are a large number of 16GB (2x8GB) DDR4-2400 kits that sell for less than that. However, all but one on Newegg are priced at $85 and up, so they've collectively risen even more. Nanya Technology is planning to transition to a 20nm manufacturing process. Doing so will cause its 30nm wafer production to reduce to 30,000 units month, though Lee did not say how many 30nm wafers it is currently churning out. Having said all that, Nanya Technology is just one company. How things shake out across the DRAM industry will depend on how well other chip makers can keep up with depend. It's also worth noting that Samsung is expected to launch its next flagship device, the Galaxy S8, in April. That could also have an impact on DRAM pricing.